Damien Cave has written a profile about me in the New York Times today that talks about my position within the art world heirarchy. Personally, I find the article fascinating in that it takes a relatively uncommon perspective by looking at the art world from the lower rungs. This isn’t a qualitative judgement about my position or the galleries that represent me. It’s just an observation of fact that our positions are all relative to the powerful, blue chip galleries that dominant New York, Los Angeles, and Art Basel Miami Beach. I do want to qualify my characterization of Mr. Deitch by saying take a look at his gallery website ; I’m listening to the music and looking at ice cream cones right now. I was trying to make an analogy about the way he markets his artists with a whimsy that masks an aggressive business practice. The many gallery directors working for Mr. Deitch are responsible for promoting and marketing each of the artists. Mr. Deitch puts up an enticing, cheery front for the sometimes ruthless business of dealing art. Unfortunately, I have no idea if Mr. Deitch was presented with my quote or the context for it, and hats off to Mr. Deitch for taking the high road if he was aware of my sensational and satirical comment about one perception of his identity as a major dealer in the art world. At least Mr. Deitch responded on record for Mr. Cave’s article, which apparently many others were unwilling to do. Perhaps Mr. Deitch also recognizes that press is press. Success, then, is all relative within the art world and I recognize that I am not working outside of the system, but from within the system and with galleries who’ve taken considerable risks exhibiting my work. What Cave’s article does for me is validate their early support and belief in my work. I’ve been slowly building an exhibition record largely on the support of art dealers beginning with Leah Stuhltrager and Cris Dam at Dam Stuhltrager who gave me my first exhibition opportunities. My affiliation with them led to an opportunity to show with Platform Gallery run by Stephen Lyons in Seattle that lead to two solo exhibitions and group exhibitions including The There currently on view at the gallery. Showing with Dam Stuhltrager and Platform helped me develop a relationship with Schroeder Romero Gallery run by Lisa Schroeder and Sara Jo Romero. The gallery is currently forming a new partnership with Sienese Shredder and will be opening up in a new space this spring with a new model for showing contemporary and historical work. Most recently, I’ve begun showing with Charlie James Gallery in Los Angeles, and my current show No One Here Gets Out Alive has gotten strong reviews in the LA Times (along with comments that strongly disagree), Artforum.com , as well blogs like Artwhirled. These galleries as well the secondary fairs including Aqua and Pulse have helped bring my work to a broader audience, even though that work may be critical of the commercialization of art, the emphasis on celebrity and stardom, and the stratification of the art world. When I say that there are a lot of contradictions, I mean it. The gallery system and the attendant art fairs remain the primary model for exhibiting and selling work. The thing that should be clear is that there are a lot of artists and galleries out there struggling to survive and even grow during the recession and many have not. It’s humbling to be the focus of Mr. Cave’s article and it is because of the work I’ve shown. 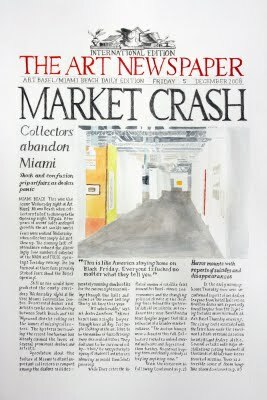 Mr. Cave saw a print at Aqua Art Miami last year called “Market Crash” (see above) that caught his attention about the potential dangers of an art market bubble. If it seems unusual for the Times to look at Art Basel Miami Beach from the outside looking in, it’s because it is. I guess I’m writing this post to explain that it’s taken a long time to reach a point of recognition, Times article or no Times article. Contrary to Mr. Deitch’s sentiments, there may be a real difference between slowly building a reputation from the ground up than being vaulted into the spotlight. It’s the difference between being an art comet, blazing in and out of the art world, versus climbing slowly up the rungs of the system towards broad recognition. My recent interview with David Goodman for BOMB Magazine gets into more of my background and motivation for making art as we discuss the hierarchy of the art world. I can’t please everyone, and I’ve really pissed some people off in the process, but it should be a challenge for every artist to claim a unique space within the art world whatever their genre despite the influence of the market. Michael Kaiser has a great article about how money and market forces can actually slultify the arts by hindering risk-taking and growth. Read it, and then go make some art. I’m going to continue working on the Hooverville drawing with artist Jade Townsend, which we hope to exhibit this spring.